Received: April 30, 2018; Published online: June 30, 2018. We identified osteoclast-derived SLIT3 as a new coupling factor using fractionated secretomics. Coupling links bone resorption to bone formation. SLIT3 stimulated the recruitment and proliferation of osteoblasts into bone remodeling sites via activation of β-catenin. Autocrine signaling by SLIT3 also inhibited bone resorption by suppressing the fusion and differentiation of pre-osteoclasts. All mice lacking Slit3 or its receptor Robo1 showed an osteopenic phenotype with low bone formation and high bone resorption. A small truncated recombinant SLIT3 protein increased bone mass in an osteopenic mouse model. These results suggest that SLIT3 is a novel therapeutic target in metabolic bone diseases. Bone remodeling entails constant replacement of old bone by new bone under normal conditions. Coupling, the process of osteoclastic bone resorption followed by osteoblastic bone formation, occurs during bone remodeling. Its imbalance leads to metabolic bone diseases such as osteoporosis. Coupling also limits the therapeutic efficacy of antiresorptive agents including most of the anti-osteoporotic medications, because these agents suppress bone formation as well as bone resorption. Their long-term adverse effects, such as osteonecrosis of the jaw, atypical femur fracture, and delayed bone fracture healing, occur as a result of coupling, because of inadequate new bone formation. Bone anabolic agents exhibit limited therapeutic efficacy under conditions of suppressed bone resorption, because coupling factors may be depleted in these conditions. Therefore, it is important to discover a coupling factor, which acts as a bone anabolic factor even in conditions of suppressed bone resorption. To date, several coupling factors have been identified, and are categorized into 2 classes according to their origin (Takeshita S et al. (2013) J Clin Invest 123, 3914–3924). One class includes factors derived from the bone matrix during bone resorption, such as transforming growth factor β and insulin-like growth factor 1. The other class comprises factors derived from the osteoclasts such as sphingosine-1-phosphate, WNT10B, bone morphogenetic protein 6, and collagen triple helix repeat containing 1. Currently, it is regarded that osteoclasts are the major source of coupling factors. Their functions have been identified in clinical trials investigating antiresorptives and findings of our in vitro study (Martin TJ and Sims NA (2005) Trends Mol Med 11, 76–81; Kim BJ et al (2012) Bone 51, 431–440). Their major action is mediated via osteoblastic recruitment at bone remodeling sites, rather than differentiation, proliferation, or apoptosis of osteoblasts. However, to the best of our knowledge, no study has identified osteoclast-derived coupling factors acting on osteoblast migration by using an omics approach. In addition, attempts thus far have failed to develop a drug based on coupling factors, which prompted the quest for new coupling factors. We performed fractionated secretomics to identify molecules that stimulate osteoblastic migration from osteoclasts, and selected a candidate based on three criteria. First, its expression should be higher in mature osteoclasts than in immature cells. Second, it should stimulate osteoblastic migration. Lastly, osteoblastic migration stimulated by an osteoclast-conditioned medium should be abrogated by the suppression of specific factors in osteoclasts. Only SLIT3 completely satisfied all these 3 criteria. SLIT were originally discovered as a chemorepellent that controls axon crossing in the midline of the brain, and occurs in 3 isoforms (SLIT1–3) (Blockus H and Chédotal A (2016) Development 143, 3037–3044). Their receptors manifest 4 isoforms (ROBO1–4). NFκB p50 and CREB activated during osteoclastic differentiation, directly binded to the promoter region of Slit3, resulting in stimulation of SLIT3 production. SLIT3 stimulated osteoblastic migration and proliferation via increased osteoblastic β-catenin activity, via its dissociation from N-cadherin. Conventional Slit3 KO mice showed decreased bone mass and formation. In addition, surprisingly, the KO mice also showed high bone resorption. In vitro studies showed that SLIT3 suppressed osteoclast formation by affecting the migration and fusion of pre-osteoclasts via suppressed small GTPase Rac activity, suggesting that the osteoclast-derived SLIT3 may not only stimulate bone formation as a coupling factor, but may also represent a stop signal in bone resorption during bone remodeling. The SLIT3 receptors include ROBO1 and ROBO2 in osteoblasts, and ROBO1 and ROBO3 in osteoclasts. Conventional Robo1 KO mice and mice lacking Slit3 specifically in osteoclasts showed low bone mass, decreased bone formation, and high bone resorption. Collectively, these features demonstrate that osteoclast-derived SLIT3 is a coupling factor with an osteoprotective role and synchronously stimulate bone formation and inhibit bone resorption (Diagram 1). From a therapeutic perspective, SLIT3 may be an ideal target because of its dual actions on bone formation and resorption. To confirm its clinical relevance, we performed clinical studies in postmenopausal women. A next-generation sequencing study has shown that only 1 Slit3 single nucleotide polymorphism out of the 7 genes of Slit1–3 and Robo1–4, was associated with BMD in 4,877 postmenopausal women. Higher circulating SLIT3 levels were associated with higher BMD in 346 postmenopausal women. The large size of human SLIT3 (approximately 170 kDa) may interfere with drug development. It is known that the shorter fragment of SLIT3, i.e., SLIT3 LRRD2 binds to its receptor (Howitt JA et al (2004) EMBO J 23, 4406–4412). 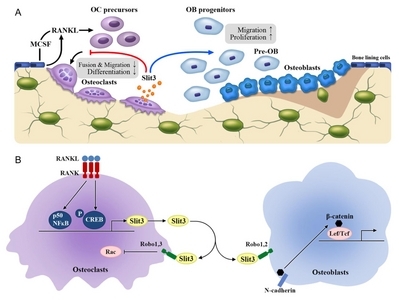 With an efficacy and mode similar to that of the whole SLIT3, the human SLIT3 LRRD2 stimulated osteoblastic migration and proliferation, and suppressed osteoclast formation. Its intravenous injections protected ovariectomized mice from bone loss. However, frequent injections of LRRD2 are needed for sufficient treatment efficacy in vivo, suggesting a short half-life in vivo. Hence, the development of a portable self-injecting or long-acting form of SLIT3 LRRD2 is essential for clinical application. In conclusion, the results of our in vitro, animal, and human studies demonstrate that osteoclast-derived SLIT3 plays an osteoprotective role by synchronously stimulating bone formation and inhibiting bone resorption. Thus, SLIT3 is a novel therapeutic target in metabolic bone diseases. The present report was supported by grants from the Korea Health Technology R&D Project, Ministry of Health and Welfare, Republic of Korea (HI13C1634 and HI15C0377) and from Asan Institute for Life Sciences, Seoul, Republic of Korea (2015-347). Fig. 1. A schematic model showcasing the action of SLIT3 in bone remodeling. (A) Osteoclast-derived SLIT3 stimulates osteoblastic migration and proliferation in a paracrine manner, and suppresses osteoclastic fusion and differentiation in an autocrine manner. (B) Osteoclasts produce and secrete SLIT3 via binding of p50 NF-κB and p-CREB to the promoter regions of Slit3. SLIT3 stimulates β-catenin activity by dissociating from N-cadherin via ROBO1 and ROBO2 receptors in osteoblasts, and suppresses Rac via ROBO1 and ROBO3 receptors in osteoclasts. OC, osteoclast; OB, osteoblast; MCSF, macrophage colony-stimulating factor; Lef/Tcf, lymphoid enhancer-binding factor 1/T cell-specific transcription factor; RANKL, receptor activator of nuclear factor κB ligand.